Indian security agencies now estimate that a large number of disused or sparingly used airfields across the country could be a major threat to national security. Terror groups could use these airfields to launch an attack through the air at any installation in India like the attack on twin towers in New York in 2001. 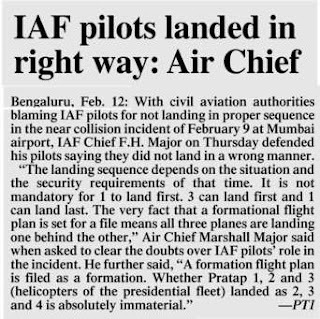 IAF chief Fali Homi Major today made it clear that these airfields can pose a threat as a light aircraft can use them for “not so honest purposes”. He was responding to a question if such airfields are a threat to the security here on the second day of the Aero India show today. Stationing patrols there and keeping them under the security scan is under the ambit of the state government, Major. Separately, sources in the IAF said the Ministry of Home Affairs has asked that a list be prepared of all such airfields. The local police station SHOs has been asked to ensure that each landing and take off by a helicopter or private plane be recorded and be in the knowledge of the local police. Just last month, the MHA had issued instructions to the states that no one should be allowed to hire a helicopter without prior permission from the local police. More than 500 such airfields exist in the country, some of them belonging to the World War-II era when the British built landing strips. Post-independence, some of these even got proper runways for landing. A large number of these airfields do not even have a perimeter fence or a wall hence and provide for an easy access to anyone who could hijack a plane parked on the runway or choose to commander the plane to any destination desired. The IAF chief today admitted that the complete radar coverage existed in critical areas but to cover the entire nation it would take time. Sources explained that a problem arises when a private plane or chopper takes off with permission from the DGCA from a major airfield and lands at a report landing strip. How many days that aircraft remains parked at the remote strip is without any knowledge of any authority. From there, the pilot takes off and lands elsewhere. Till now a free for all exists. The Army has commenced the trial by a general court martial (GCM) of a woman officer who had levelled allegations of physical and mental harassment against her superior officers, for her alleged acts of professional impropriety. Earlier, a court of inquiry (COI) had held Capt Poonam Kaur blameworthy on several counts, following which the Army commenced disciplinary proceedings against her. The GCM, convened at Patiala, held its first hearing yesterday and has now been adjourned till January 17, sources said. She is reported to be the second woman officer in the Army to be tried by a GCM. Court martial proceedings against another woman officer are being held in abeyance as the matter is pending before the Supreme Court. In July last year, Captain Poonam, then posted with the 5682 ASC Battalion in Kalka near here, had accused three of her seniors, her commanding officer Col R.K. Sharma, the unit’s second-in-command Lt Col Ajay Chawla and adjutant Major Suraj Bhan of harassing her over the past few months. The COI instituted into the allegations held her blameworthy for disobedience of lawful command, wrongfully getting married accommodation allotted to her, unauthorised contact with the media and improper association with her driver. The pilots and ground forces of the Indian Air Force will soon have real-time data and will be inter-connected across the country. Using a countrywide optic fibre cable network of its own, the IAF will connect all airbases and forward formations to provide an operational data link between network sensors, command posts and airbases. Within two years, the link will be in place, said Air Chief Marshal Fali Homi Major while addressing a press conference at the Aero India show here today. In the first project, 165 nodes have been set up and these will be linked by July hence activating the voice and data link between these nodes that will in turn service major IAF installations. 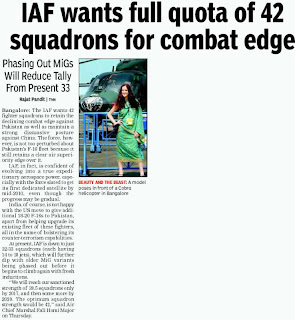 When asked about the level of fighting squadrons of the IAF having gone down to 34 from the sanctioned 39.5 squadrons, the IAF chief said this was part of the any air force that the fleet strength depletes when fresh inductions take place. We will have the desired level by 2017 and even more by 2020, however, the present strength does not mean that the combat edge has been lost. 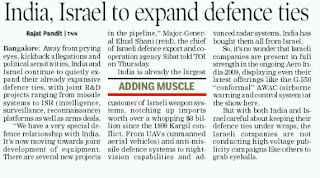 In the view of the IAF chief, the use of unmanned aerial vehicles (UAVs) for spying and intelligence gathering will increase in future. The UAVs are getting better and improving. The payloads are increasing and correspondingly the deployment will also increase. On the phasing out of the MiG 25, a very high altitude aircraft used for reconnaissance, better and more effective means are available now. A light combat helicopter (LCH) being developed by the HAL will be put on flight test in this August. This was said here today by HAL chief Ashok K Baweja. The LCH will be able to perform anti-infantry and anti-armoury roles and can be used in high altitudes. Baweja said the HAL had received orders worth Rs 16,000 crore for the advanced light helicopter Dhruv developed by it. Out of the total orders, about Rs 1,000 crore was for exporting the helicopters, he said. “We are eyeing the South American market for selling more of our helicopters”, Baweja said. He said the HAL would be setting up a base in Ecuador for maintenance and repair of the helicopters sold by the HAL to the South American countries and also for promoting the sale of the helicopter and other HAL products in that part of the world. Ecuador and Suriname were among the countries that were acquiring Dhruv. Baweja also said that the intermediate jet trainer being developed by the HAL had been fitted with a new engine. “It will be put on for test flying next Monday”, he said. Baweja, who was addressing a press conference at the Aero India expo here, said the HAL was manufacturing 40 light combat aircrafts (LCA), including 20 fighters and 12 trainers. This would be followed by manufacture of an advanced version of the LCA. The engine for the advanced LCA version was yet to be chosen, he said. The HAL chief said the naval version of the LCA being developed by the HAL was facing some problems with regard to the undercarriage. “We will also have to select an engine for it”, Baweja said and added that two prototypes of the naval LCA were being manufactured. Two top Army officers, including Army chief General Deepak Kapoor, spent considerable time in the pavilions set up by the Israeli heavy munitions and missiles manufacturing industry at Aero India-2009 here today. Kapoor checked out Israel’s Rafael Advanced Defence Systems, especially its short range and medium range missiles on simulators. He blew up an enemy tank using the short range “Spike” missile. “He was superb,” a thrilled Zohar Elkoby, representative of Rafael’s Precision Tactical Weapon System wing, said. Kapoor also visited the pavilion set up by the Elbit system. The system specialises in the manufacture of defence airborne systems, unmanned vehicles and combat vehicle systems. “Some of the Israeli equipment is quite good. We have to find out if these equipments perform well in our conditions also,” Kapoor said. On whether India was thinking about buying Israeli heavy weapons, Kapoor gave a guarded reply. Two cases of possible collisions between aircraft have shaken up the public’s confidence in air safety. Just a day after a near-miss involving an Air India aircraft and a IAF VIP squadron helicopter at Mumbai airport came the report of an Air India flight narrowly missing a government IL-76 plane near Jorhat in Assam. While it is too early to find out what exactly happened, it is clear that safety has been compromised. The pilots’ quick response, an emergency stop aborting take-off on the one hand and a quick dive in the second case saved the day. However, the question remains: Why was this situation allowed to develop in the first place? While the number of airlines and aeroplanes taking off and landing at Indian airports has been rising sharply, adequate attention has not been paid to infrastructure, manpower requirements and safety. And unfortunately, this results in mishaps and near-misses and this is reflected in the figures, too. There were 13 incidents in 2003, 15 in 2004, 21 in 2005 and 26 in 2006. Many of them, like the two recent cases, involve a mix of civil and IAF aircraft, thus pointing towards lack of coordination. The statements by Indian Air Force officials and the Directorate-General of Civil Aviation (DGCA) after the incidents have given an impression of discord between the two organisations. It is obvious that steps taken to iron out their differences have not yielded results. Immediate steps need to be taken to ensure smooth functioning of these two bodies. The aviation sector is growing and the DGCA is right in seeking help from the International Civil Aviation Organisation to set up national projects to monitor flight safety, airports and air navigation. The government must take short-term measures like acting on the enquiry reports’ findings and ensure that such incidents are not repeated. "Your mission is to move to the area marked Charlie Papa One Six and fire on receiving the command." Maj Amit Sood sits on top of his Russian-designed T-72 tank surrounded by soldiers from his unit, as he traces his finger across a map mounted in front. "Does anyone have any doubts?" he asks his men, all dressed in olive-green battle fatigues. "No Sir," they shout in unison before scrambling off to board their tanks. We're in the Rajasthan desert in western India, less than an hour's drive from the Pakistan border, witnessing an Indian army training exercise. Minutes after the order, the tanks roar across the sandy landscape, their giant wheels churning up dust, as they zero in on their target. A burst of ear splitting explosions follow - and then plumes of smoke to denote a perfect hit. The "enemy" had been eliminated. As tensions rise with Pakistan after the Mumbai (Bombay) attacks, the movements of the Indian army have taken on a new urgency. No one actually believes a confrontation will take place but the intent to signal a state of readiness is clear. 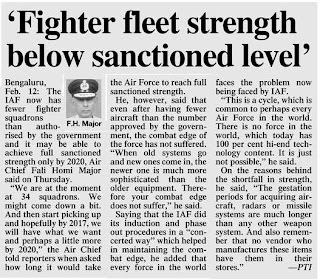 All this at a time when the Indian army, the world's fourth largest, is also facing a major crisis, one that could affect its battle-readiness. It's facing a shortage of more than 11,000 officers - many of them from middle ranks such as Maj Sood, men who would actually lead it in battle. That is something of major concern to the government. On Monday, the Indian army chief, Gen Deepak Kapoor, said he felt the armed forces were no longer an attractive career option for young Indians. 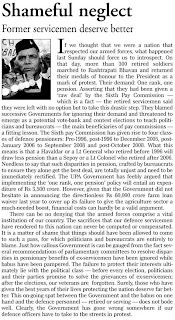 "Post-independence, our youth would forego much higher paying job opportunities to serve in the military," the Press Trust of India quoted him as saying. "But some of [that] ethos has perhaps undergone a bit of change." It's the spirit of adventure and sense of history that have drawn men like Maj Amit Sood to the army. He serves in the Skinner's Horse regiment, one of the oldest in the Indian army which was set up by a maverick Scotsman in 1803. His father also served in the same regiment and a large portrait of him adorns the regiment's ornate mess, which also has regalia from the various campaigns the unit has fought through the years - the Boxer Rebellion in 1900 and the Anglo-Afghan campaigns of the 19th Century. But increasingly, you also find people like Maj Amar Kwatra. A fourth-generation, highly-decorated army officer whose grandfather fought for the Royal Indian army in World War I, he has left the army to fly private jets for the rich and famous. As he casts his eye over a gleaming Hawker 750 eight-seater aircraft in a private hanger at Delhi airport, Maj Kwatra talks about his frustration with the army. "I was disillusioned - there were many things that bothered me. "I mean, no one joins the army for the money but you have to draw the line somewhere. You need a basic minimum to maintain your standard of living." Like many officers, Major Kwatra believes that it takes too long to make your way up the ranks and that the armed forces no longer command the respect they used to. At the stately Ministry of Defence headquarters in Delhi, it's something that has not gone unnoticed. "We have taken a number of measures including improving pay and taking on board recommendations that would help improve career prospects," says India's Minister of State for Defence, Pallam Raju. But he acknowledges that the government can never compete with the private sector. "The economic downturn has meant that jobs in government or the armed forces may still be attractive. But we cannot take it for granted. Eventually when the economy improves, the private sector becomes a much more attractive option," he says. Many Indians joined the army after the country's independence because of a sense of national pride but also because it offered a stable income. The army also offered a relatively comfortable life in large cantonments with plenty of institutional support - hospitals, schools and subsidised rations. That's one reason why quite a few Indians still head to the elite Indian Military Academy (IMA), set up during British colonial rule along the lines of the Royal Military Academy at Sandhurst. The cadets are initiated into a tough, regimented life - that includes waking up at 0430, military drills, commando training, 11km (6.9 miles) cross-country runs carrying a 10kg load and plenty of firing practice. "When he is finally commissioned from here, the cadet will have the qualities of leadership and intellect imbibed in him," says Lt Gen RS Sujlana, who heads the IMA. 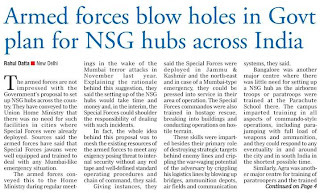 "From here they'll go straight into battle - in Jammu and Kashmir and the north-east," he adds, referring to counter-insurgency operations almost exclusively conducted by the army. Increasingly, and especially after the Mumbai attacks, the focus is shifting towards counter-terrorism and counter-insurgency operations, which is reflected in the cadets' training. In a new drill conducted at a special facility at the IMA, top recruits are trained in close-combat fighting. Armed with Insas rifles they burst into a building. Moving from room-to-room in semi-darkness they fire at cut-out models representing militants holding hostages. 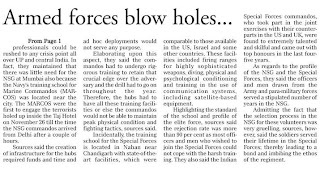 "It is to train them for operations in built-up, urban centres, something which is increasingly relevant in the present environment," says their instructor, Lt Col Gunpal Singh. It's a role that represents a new challenge for the Indian army. The question is - can they still find the men to lead them in battle? NEW DELHI—Indian Ministry of Defence is much concerned over growing disinterest among the Indian youth for defence services. The Indian Armed Forces are now looking at various methods to attract the youth and make them aware about immense possibilities in defence services. However, despite all efforts, a negative trend is continuing. A senior Indian Recruiting Officer of Army said "We want officers and Jawans but youths are not turning up according to our expectations". He added "Even after increase in salaries of the lower ranks, the recruitment board is not getting a good response". Meanwhile, Indian Army has recently adopted a new method by participating in trade fairs where a whole set p of Armed Forces is being separately displayed to attract the youth. However, this too could not being results. Unlike the Armed forces recruitments in Pakistan where thousands of applicants are available for a handful of vacancies, the Indian recruitment centers usually give deserted look. 12/02/2009 13:44 BANGALORE (India), February 12 (RIA Novosti) - The BrahMos supersonic cruise missile will be commissioned by the Indian air force in 2012, the head of the BrahMos Aerospace company said on Thursday. India is planning to produce at least 140 Su-30MKI fighters by 2014 under a Russian license with full technology transfer rights. Analysts estimate that India could purchase up to 1,000 BrahMos missiles for its armed forces in the next decade, and export 2,000 to other countries during the same period. During a visit by Russian Defense Minister Anatoly Serdyukov to India last year, the two sides agreed to develop a hypersonic version of the missile, to be known as BrahMos-2. The tactical highlights of NISHANT include multi-mission day/night capability using advance payloads, jam resistant command link and digital down link. It is a highly mobile, compact and easily deployable system and can undertake day/night battle field reconnaissance, surveillance, target tracking and localization. It can also help in correction of artillery fire. With an endurance capacity of 4 hours and 30 minutes, it can attain maximum speed of 185 km per hour. Instead of behaving like a villain in some third-rated Indian movie, the Indian army chief can learn a lesson or two from Pakistan army chief’s studied calm under immense pressure. ISLAMABAD, Pakistan—Indian Army Chief General Deepak Kapoor has once again come up with a highly irresponsible and rather humorous statement when he stated that Indian Army was ready for surgical strikes, missile and infantry attack inside Pakistan. This statement of the Indian Army Chief came when Pakistan government and Pakistani authorities were conducting a high profile probe into the Mumbai attacks on the basis of what should be termed as a rather shady dossier provided by the Indian government. The statement came when the Pakistan government was doing the job with all sincerity and when the Indian government itself had agreed to wait for the outcome. 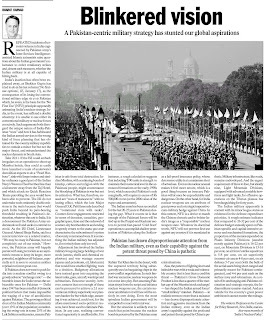 In such a situation, when Pakistan and the entire global community was making an all out effort to ease tensions between the nuclear archrivals, General Deepak Kapoor jumped the stage with a statement that surprised everyone. At this sensitive moment, the Indian Army Chief was supposed be behaving with some sense and responsibility and in accordance with his stature as the chief of the world’s third biggest army. The behavior of General Kapoor leaves one to ponder about how fragile the peace and security of the globe is with one of the world’s biggest armies having a Chief with this sort of a mindset. General Deepak Kapoor can learn a lesson and take inspiration from Pakistan’s Chief of the Army Staff General Ashfaque Pervez Kayani, who has kept his cool and behaved like a real General and a Commander under the worst circumstances and opted for restraint instead of behaving like a villain in some third-rated Indian movie. The Daily Mail believes that there are chances that the Indian government, after losing its diplomatic and political war against Pakistan, might have ordered its Army Chief to launch a “verbal” military offensive against Pakistan. However, if this hypothesis is true, even then General Kapoor should have used his own head and instead should have told his government about the consequences of such a move and its impact on regional and global peace initiatives. But it appears that the typical Indian hegemonic philosophy has now very deeply crept into the Indian military leadership. Indian military commanders have started making immature statements over matters of highly sensitive nature. 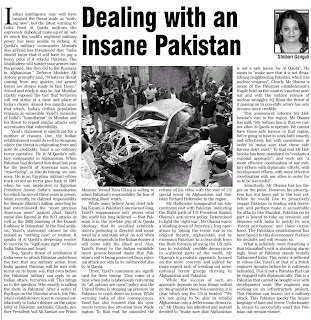 The Daily Mail strongly advises the Indian government that it should, before appointing it services chiefs, and especially the Chief of Army Staff, send them to Pakistan where they should be trained to behave in accordance with their stature and profile and to learn how to keep their cool and opt for restraint during a moment of crisis. The Pakistani military schools, with their high premium on discipline and personal conduct, are renowned for instilling such professional behavior. The defence R&D and defence production model that India had adopted, did not encourage the participation of private industry, while the government sector came up short of expectations. In 2008, the Defence Research and Development Organisation celebrated its golden jubilee. Since its inception in 1958, the DRDO has achieved some spectacular successes. It also has many signal failures that are a blemish on its name. The successes include the Integrated Guided Missile Development Programme that produced the Prithvi and Agni series of ballistic missiles and, subsequently, the BrahMos supersonic cruise missile in a collaborative venture with the Russians. Among the major failures are the Main Battle Tank Arjun that has not met some critical general staff requirements of the Indian Army despite time and cost overruns and the Light Combat Aircraft that still appears to be light years away from operational induction into the Indian Air Force. However, to DRDO's credit, it worked under extremely restrictive technology denial regimes and with a rather low indigenous technology base. Consequently, the policy of self reliance did not yield substantial gains as India continued to import almost 70 per cent of its defence equipment for over four decades, primarily from the Soviet Union and, later, Russia. And, if some MiG-21 aircraft and other weapons systems were produced in India, these were manufactured under license and no technology was ever transferred to India, with the result that even though India spent large sums of money on defence imports, the technology base remained where it was. At present the DRDO is in the process of deliberating upon and implementing the report of the P Rama Rao Committee report that asked DRDO to identify eight to 10 critical areas which best fit its existing human resource, technical capability and established capacity to take up new projects. Will India's plans for defence modernisation lead to a substantive upgradation of India's defence technology base and manufacturing prowess, or will the country's defence procurement remain mired in disadvantageous buyer-seller, patron-client relationships? India is likely to spend over $50 billion (about Rs 250,000 crore) on defence acquisitions over the next five years. Among the weapons systems and equipment to be acquired, the big ticket items will include the aircraft carrier INS Vikramaditya (the Admiral Gorshkov), 126 multi-mission, medium-range combat aircraft, six C-130J Hercules transport aircraft for the Special Forces, eight maritime patrol, surveillance and reconnaissance aircraft -- possibly the Boeing 737 P-8I, six Scorpene submarines, and a large number of main battle tanks, 155mm towed and self-propelled artillery howitzers, plus equipment for counter-insurgency operations. One of the major spin-offs of the Indo-US nuclear agreement is that it has sounded the death knell of the era of defence technology apartheid practiced against India by the US and many of its partners in the West. It will still be a decade or more before the ghosts of technology denial regimes are finally buried. The deeply entrenched bureaucracies in the departments of state, defence and commerce in Washington will take quite some time to they finally accept India as a co-equal partner with whom dual-use technologies can be shared to mutual advantage. US MNCs, which have always taken their bearings from their government's foreign policy leanings, will surely lead the charge and make a beeline for India. While the government continues to retain its monopoly on defence research and development, it is slowly moving away from relying primarily on the public sector for defence production. 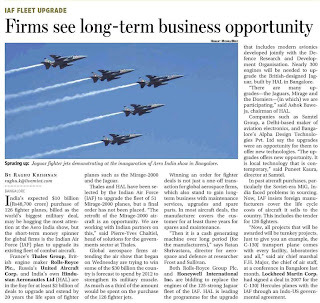 The revised Defence Procurement Procedure 2008, announced recently, continues to emphasise public-private partnerships and encourages the private sector to enter into defence production -- either on its own or through joint ventures with multi-national defence corporations, which may bring in up to 26 per cent FDI. Large-scale procurements of weapons and equipment from defence MNCs has been linked with 30 to 50 per cent 'offsets', that is, the company winning the order must procure 30 to 50 per cent components used in the system within India. This will bring in much needed investment and will result in the major infusion of technology -- even if it is mostly low-end rather than high-tech to begin with. However, the DPP is still a policy that is evolving and has many shortcomings that need to be overcome. For example, the MNCs do not find 26 per cent FDI exciting enough. There is really no credible reason why equity investment cannot be raised to 49 per cent for a JV to be really meaningful for a foreign investor. As a growing economic powerhouse that also enjoys considerable buyers' clout in the defence market, India should no longer be satisfied with buyer-seller, patron-client relationships in its future defence procurement planning. In all major acquisitions in future, India should insist on joint development, joint testing and trials, joint production, joint marketing and joint product improvement over the life cycle of the equipment. The US and other countries with advanced technologies will surely ask what India can bring to the table to demand participation as a co-equal partner. Besides capital and a production capacity that is becoming increasingly more sophisticated, India has its huge software pool to offer. Today software already comprises over 50 per cent of the total cost of a modern defence system. In the years ahead, this is expected to go up to almost 70 per cent as software costs increase and hardware production costs decline due to improvements in manufacturing processes. If a new weapons development project needs 500 software engineers, where else but in India can such a high quality work force be found? However, India cannot leap-frog to a higher plane virtually overnight. The immediate requirement is to think big in keeping with the country's growing international status and to plan for the future with a level of confidence that policy planners have not dared to do before. Perhaps a showpiece joint project with the US will lead to the unshackling of India's real potential. 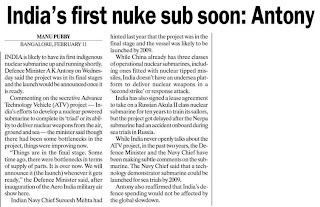 A candidate project for such a venture would be the joint development of a theatre ballistic missile defence system that is a key priority for the US and will also benefit India's nuclear deterrence. It will take the trajectory of Indo-US relations to a much higher orbit.